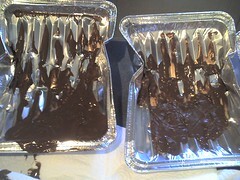 Almonds on the right, plain milk chocolate on the left. Conclusions: it was definitely hotter in Kricket's car - about 175 to 150 in Buzz's car. The plain milk chocolate melted faster than the almonds-bar. Maybe the almonds don't absorb the heat well? It definitely got hotter in the darker car.